This app adds support for devices made by Thermo-Floor AS and sold by the name Multireg, Magnum and Heatit. The Multireg / Heatit Z-Wave thermostat is an electronic thermostat for flush mounting in a standard wall box for regulating electric floor heating. 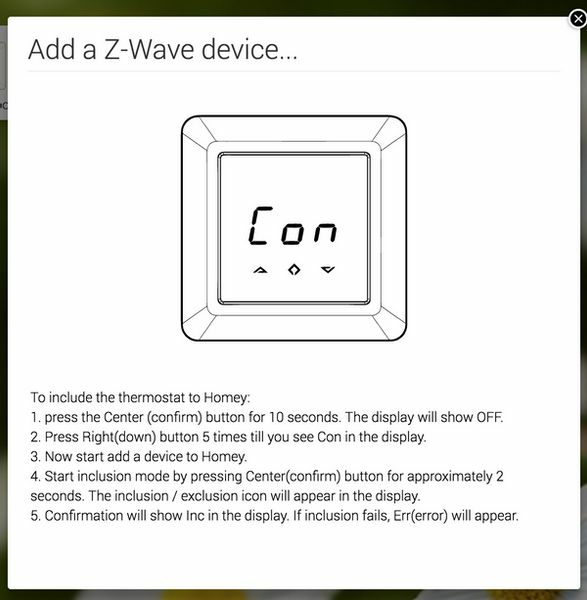 The thermostat has a built-in Z-Wave chip that can be connected to Home Automation systems like Homey. If possible, please report issues at the issues section on Github otherwise in the above mentioned topic. Note: Temperature will show actual temperature if the thermostat internal settings are set correctly (== to either an external temperature sensor (A2) or external floor sensor (F). The internal temperature sensor has been disabled. @anne I'm aware of your earlier comment. Both the Multireg and Heatit are Z-wave certified products (and have different type numbers, although the Z-wave ID's are the same), I cannot find this information for the Magnum Z-wave thermostat. I will clarify with with Magnum heating. By the way, I received some useful information on something related to another Magnum thermostat via info@magnum.nl, they were quite responsive. Alpha testing is progressing well, especially with the support of @npeters, @dbonsaksen and the thermostat that has been provided (temporarely) by Robbshop. Most functionality is working; thermostat modes (off / comfort / eco / cooling), setpoints and states. Some smaller issues need to be resolved before releasing to the app store. If you like to test, check the alpha branch on github, and contact me on Slack so I can add you to the closed user group. The Thermo-Floor app has been submitted to the app store and is pending approval. Thanks! It took several attempts before homey and heat-it were on speaking terms, due to include-timeouts and some zwave errors, but now it works. Thanks for putting in the effort, much appreciated! Thanks for a great app, just a question though. I've just added my Heatit thermofloor and everything works great, but Homey shows in the setting for the thermostat that "secure = no". All my other z-wave plus devices shows "yes" in that section. Not sure but i guess that it means that encryption isn't used? How does it look for you other guys that have Heatit thermostats in this section? @Goran I appreciate your feedback! 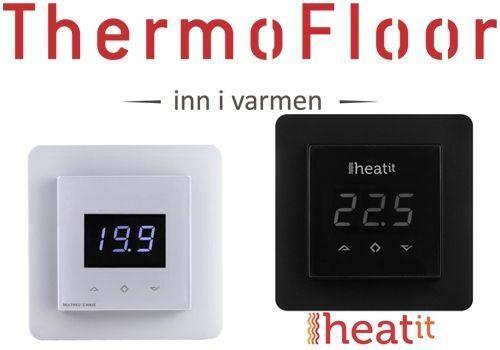 The Thermofloor thermostat (incl. re-branded Heatit / Magnum) are equipped with a Z-wave chip and not a Z-wave plus chip. The latter supports encryption (secure communication) and if battery powered is more energy efficient. So these thermostats will be added non secure to Homey. This will not limit the usage options if this thermostat. One minor limitation is that it will not be possible to add secure Z-wave devices to association group 2 to switch or or off when the thermostat switches on or off. This can be contained by by creating a flow within Homey. 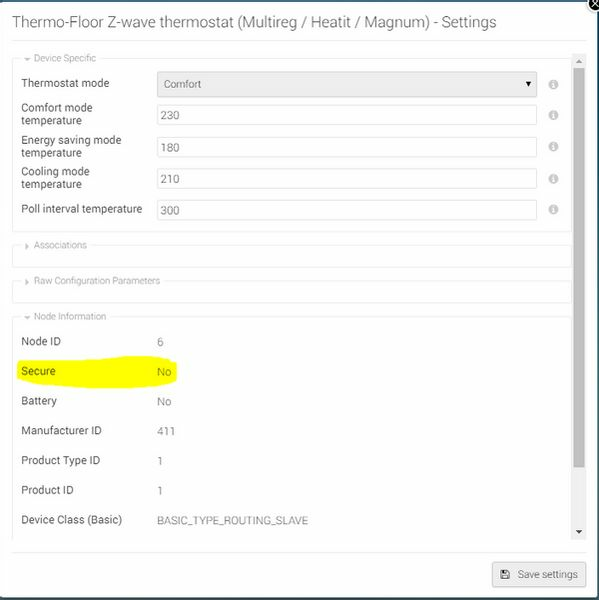 Thermofloor will announce this quarter a new version of it’s Multireg thermostat that will be based on the plus chipset; since the Z-wave alliance is enforcing encryption for new to be certified devices. The Multireg/Heatit thermostats IS Z-Wave Plus certified. In january 2018 there will be a new version of the thermostat which includes Power metering. @haakeik ah, indeed it’s Z-wave Plus my error. Z-wave Plus supports encryption but for older devices doesn’t mean encryption is enabled / implemented by the supplier. It can be added by a FW update, but current FW (1.18) does not have encryption enabled. Could those thermostats be integrated in this kind of system? I agree, great app and good devices. I have four Heatit thermostats running on Homey now, working just fine. But I've had a hard time trying to understand the association limitation due to the ecryption before I read this post. 2. 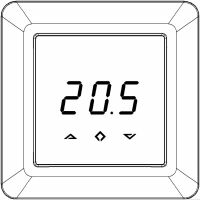 Would it be possible to uppgrade the firmware for the thermostats to make them compliant to Z.wave plus? As I said I have four of them, changing to a new model is expensive. 3. Do anyone have a good example of a flow doing this. I had expected a trigger on the "state" to do this the easiest way. Now that the Heating Scheduler App is no more, do you have any plans to add this functionality to this app? (I have 7 Heat-It controlled zones that I would really like to schedule 'centrally' rather than one by one if possible). Does anyone know when the 'heatit-z-therm2' is available? I am working on a renovation and I have to purchase a new underfloor heating. Do you know if Heatit Z-water can be controlled by homey? 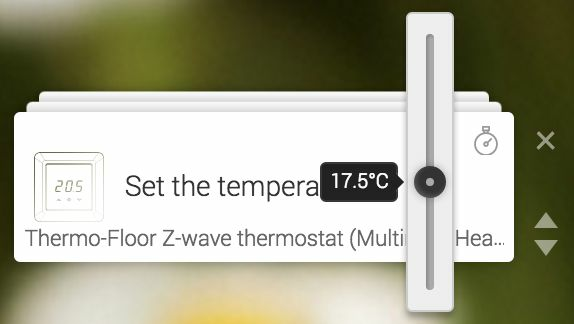 There is an app available : https://apps.athom.com/app/no.thermofloor I'm waiting for the Therm 2 (because it's zwave-plus (secure). When it doesn't work with this App. I will contact the programmer (Ted Tolboom) true Github and ask if he will modify it. Even I will support it with a PayPal donation. 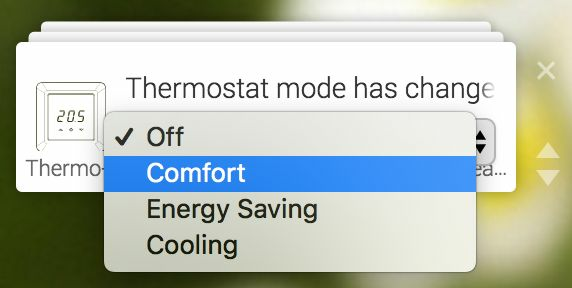 I still hope that another dev will pick up the task to re-create this heating scheduler app. Yes, I have been monitoring new developments from Thermofloor / Heat-it.. I did not see the products popping-up in the stores yet; could have missed it off course..
Let me check with Thermofloor first. It's works great with Homey? And there is no problem with shipping to the Netherlands? I don't if it "works great with Homey", because I don't know Homey very well. I have 7 that worked fine with FIbaro HC2, and I've added 2 to Homey, using the driver in this thread but without a proper scheduling function, I've struggled with 'flows' to try to get them to be useful again as automated devices. I think Vesternet ships worldwide. It might be a bit early to ask about this, but do you know if this app will support the HeatIT Z-TRM2 when it arrives? EDIT: So sorry, I didn't see that this was already answered!